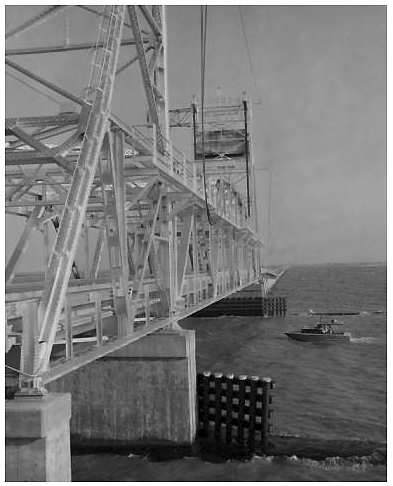 Dauphin Island's first bridge, a 3 1/2 million dollar project opened July 1955. Photo is close up of the center lift span, sometimes called the draw bridge section. over the Intracoastal Waterway allowing commercial barge and recreational watercraft. Mobile Bay on the east side. benefit only a few. In July 1949, voters defeated the proposal. local leaders approached his successor, Gordon Persons, with the new plan. bridge's cost. The state would cover the balance. added $1.3 million to the Chamber's contribution. got the contract to build the bridge and completed its construction in 1955. Commission. A $1 toll was set to repay the debt from the revenue bonds. The Gordon Persons Bridge opened July 2, 1955.
and curves back to the bridge.